Collaboration can be a wonderful thing, particularly when two parties have such a worthy goal as Curvy Sounds and Polestar Studios. The Newcastle institutions have decided to team up this month to showcase a handful of bands they believe deserve your attention, and we wholeheartedly agree. 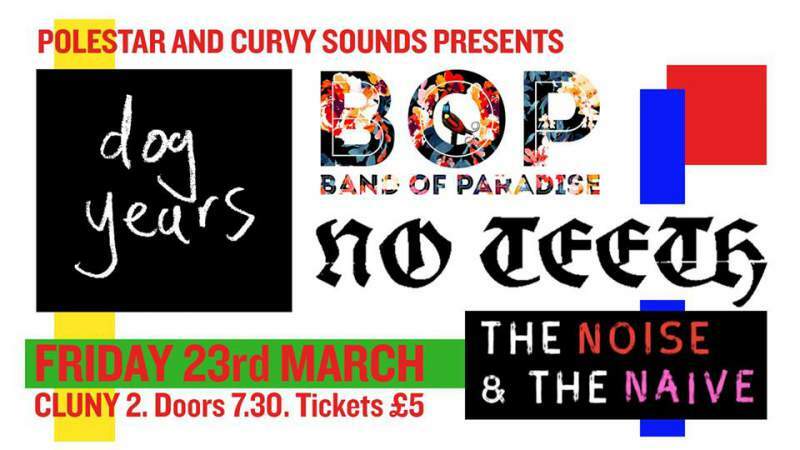 Headlining The Cluny 2 on Friday 23rd March are harmonious fun popsters Dog Years; Band of Paradise, made up of members from Apache Viking and Free Diamonds; doom pop trio No Teeth and awesome pop-punk duo The Noise & The Naïve.